Question: How can I manage my Internet Explorer 7 add-ons and where can I find out what add-ons I have installed? 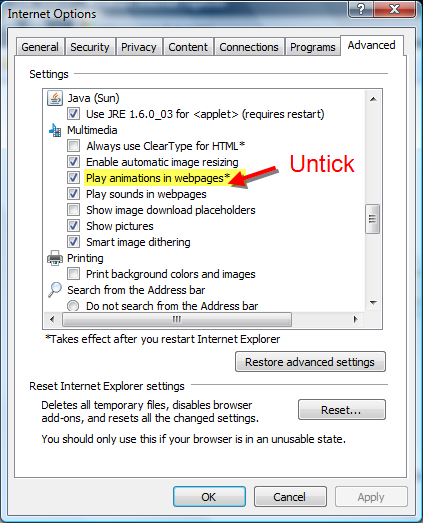 1) Open Internet Explorer and click on the ‘Tools‘ button. 2) In the drop-down menu, click ‘Manage Add-ons‘, and then click ‘Enable or Disable Add-ons‘. • To display a complete list of the add-ons that are installed on your computer, click ‘Add-ons that have been used by Internet Explorer‘ in the drop down menu. • To display only those add-ons that were needed for the current web page or a recently viewed web page, click ‘Add-ons currently loaded in Internet Explorer‘ in the drop down menu. • To display add-ons that were pre-approved by Microsoft, your computer manufacturer, or a service provider, click ‘Add-ons that run without requiring permission‘ in the drop down menu. 4) Click the add-on that you want to change once and select what you want to do in the Settings area. Then click ‘OK‘. Question: How can I prevent Internet Explorer 7 from automatically saving my passwords and usernames? 1) In Internet Explorer, click on the ‘Tools‘ button located at the top right. 2) In the drop-down menu, click ‘Internet Options‘. 2) Click the Content tab in the dialog box, then click the ‘Settings‘ button and untick the ‘User names and passwords on forms‘ check box. 3) Click ‘OK‘, and then click ‘OK‘ again.